Fashion is always there, no matter what, no matter where. Fashion adapts to history and is a fascinating mirror, reflecting the society that wears it. Never is fashion more interesting than during times of great change, good times and bad, too. Wartimes are certainly bad and the global strife of World War II was indeed the worst of times. And yet, fashion prevailed, inspired by fervent patriotism, glorified pin-up girls and a rage for paper dolls. The very social fiber of the world changed as men marched off to fight. Suddenly women were thrust into new, more active roles, replacing males in the work force as well as keeping the home fires burning. Fashion immediately began to express the newfound strength of women with big, broad shoulders and slacks, practical knee-length skirts and strict tailoring. Smart suits, simple frocks, sensible shoes and a serviceable shoulder bag became the working woman’s fashion uniform. Of course, the most obvious fashion statement made during WWII was genuine uniform dressing and it was not only the men who wore government issue. There were many branches of service for women and each had its own smartly tailored uniform, a fitted jacket and sensible skirt or slacks. Olive drab, khaki, white and navy were the only color options. 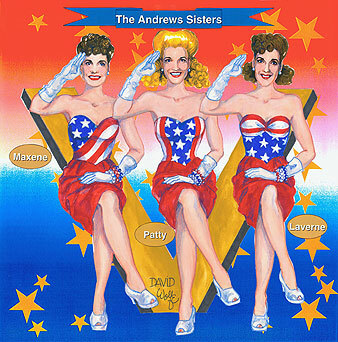 Paper dolls also enlisted in the services and many books such as WACS and WAVES, Army Nurses and Doctors and Victory were published. As the war progressed year after year, there occurred shortages of certain materials and rationing came into effect for fashion as well as food and gasoline. Silk was needed for parachutes, nylon for military supplies, metal for armaments. Man-made Rayon replaced natural fibers. Instead of wearing nylon stockings, women applied leg make-up and drew “seams” with eyebrow pencils. The media promoted make-do and mend methods for home sewers, encouraging them to turn curtains into dresses, cushions into jackets and adult apparel cut-down into childrenswear. Raw materials were scarce, and even the manufacture of children’s toys were affected. Paper was readily available and perhaps that is one reason why paper dolls became so very popular. Many of the most coveted collectible paper doll books were produced during the war years. Because so many aspects of fashion design and creation were limited by wartime restrictions, great attention was given to interesting colors, details and accessories. Color added interest to otherwise plain styles. Chartreuse, maroon, rust, ochre and teal were popular shades, often used in daring combinations. To emphasize the strong top-heavy silhouette, often decoration was applied to shoulders, and sweetheart necklines also accented the look. Many decorative elements were hard to get (beads, sequins and braid from Europe), so printed fabrics provided some of the missing eye-appeal. Exotic florals and neat polka dots were especially popular. Leather was in short supply, so cork soles became an alternative and shoes soared to staggering heights on sky-high platforms. Furs, however, were not rationed and provided some the glamour sorely missing from fashion for the duration. The movies helped to fuel one of the major fashion trends of the ‘40s. Perhaps because the present was so fraught with worry, nostalgia for a more peaceful, bygone era blossomed. The Gay ‘90s was the setting for many films like Meet Me In St. Louis, Lillian Russell, My Gal Sal and Diamond Horsehoe among others. Just as they do today, some of those movie fashions were reinterpreted into current styles for ‘40s fashionistas. Leg-o-mutton sleeves, big hats and sweetheart necklines evoked the turn of the century. 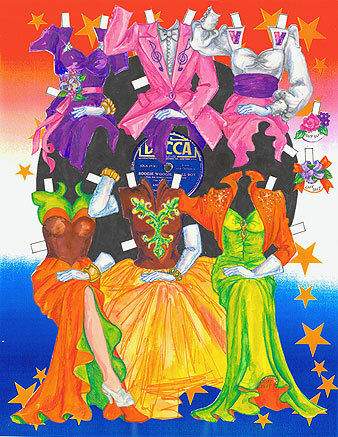 Many of the period costumes from those films were featured in the star paper doll books of the time. Without Paris to provide fantastic inspirations, fashion looked to Latin America as a source of fresh fashion, copying peasant blouses, full skirts, Mexican prints and embroideries. FDR’s “Good Neighbor Policy” focused attention on the Southern Hemisphere but it was Brazilian Bombshell Carmen Miranda whose somewhat zany fashion sense (fruitbowl headdresses and bare midriffs!) gave fashion a well-needed shot of merry madness. She, too, became a paper doll. When the war finally ended in 1945, there was a tremendous pent-up urge for the extravagance that had been necessarily put aside. It exploded with Christian Dior’s “New Look” of 1947 with narrow shoulders and long, full skirts with yards and yards of fabric. It was a wildly romantic, highly impractical, totally feminine and luxurious expression, and it returned Paris to its role of leadership and put an end to WWII fashion...that is, until the 1970s and just the first of its many recurring retro revivals.